Sickly Parasites Laughing All The Way To The Bank | The Transfer Tavern | Where football transfer rumours fly or die! One of the transfer saga’s that seems never ending is involving the lackadaisical Bulgarian Dimitar Berbatov. Before you check your calender don’t worry we have not gone back in time to 2008. Berbatov looked to be heading to Florence for a medical but once he learned Juventus were interested things changed and he missed his flight which then prompted Fiorentina to state “He doesn’t deserve to wear the shirt” and then Martin Jol’s Fulham made an interest and things changed again. Reports in the Daily Mail suggest it now seems that due to a combination of family reasons and being able to work with the man that originally brought Berba to England, Craven Cottage will be the place to go if you want to see Berbatov use his languid skills to dazzle Hugh Grant et all. With Dempsey on his way, Dembele gone and no more ageing English strikers knocking around the trendy London club, Berbatov could be a hit. It is a shame that he has fizzled out in the way he has at United but Sir Alex seems to be insistent that having a ‘big man’ is no longer the way to go in terms of tactics. Brendan Rodgers would seemingly agree with him on that one. Looking back at Berbatov’s career in Manchester it has had it’s lows but the highs far out weigh them. He announced himself to United with a sensational hat trick against Liverpool which included a stunning over head kick that showed the quality of his skills. Then he became the first non-Englishmen in the Premier League to score five goals in a game against Blackburn Rovers with one a stunning team move that he himself started in his own half. He may have joined United with a decline on the horizon but it’s not his fault that City were given millions of pounds to assemble a title challenging squad. Either way at around £5million he could be the bargain of the season. Dimitar Berbatov’s drawn out transfer to Manchester United four years ago on Saturday is reminiscent of Luka Modric’s recent move to Real Madrid. At least with Berba it didn’t carry on for over a season but both seemed to want a move away and were either dropped or refused to play when a transfer to a bigger club came calling. 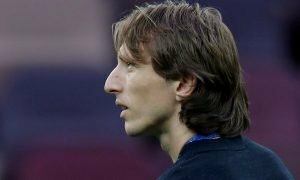 Now that Modric has finally moved on the question of whether a player has too much power must be asked. Since the PFA abolished the maximum wage back in the 1960’s the amount of power available to a player has slowly grown and once the mega bucks of Sky came in the front door in the early 90’s the amount of money that players earn is ridiculous in this time of recession. It almost feels like it has become an unwanted part of the game that has been accepted like simulation or trying to get a player sent off. Can anything be done to hinder the amount of power that a player has at a club? One answer is easier said than done, reduce the money involved in football. Whether this is done by bringing back the maximum wage cap or some other kind of brilliant scheme that I can’t think of because I am a simple football fan that enjoys the aesthetics of the game, I don’t know. Back when football was just football and not full of ‘Super Sundays’ and ‘Epic crunch ties’ players would play an entire career with a club and then receive a big pay-off with a testimonial at the end of it. I’m not saying loyalty has gone as players like Paul Scholes, Javier Zanetti, Iker Casillas and Steven Gerrard have all enjoyed long career’s at the same club. But with certain players complaining about only being offered £55,000 a week to do something that millions of kids would kill to do is a disgrace. You take the obscene amount of money out of football and you take away the greed. Very soon the mentaility changes in players as they want to play to win trophies not just to win stuff that means the club get more money and therefore they get more money. It’s no coincidence that the FA Cup is becoming the new League Cup since the amount of money in Europe has become the be all and end all for the top clubs. With all those players in the clubs being idolised like gods by people all over the land the small child kicking the football in the street wants to emulate them. So the dream is to play in Europe and then earn enough money to buy a small island. Without greed players play to win for pride again, this gives them the fulfilment that money can’t buy and so the likeliness is that they won’t really care about wanting to move for more money. I’m not saying this will stop player power but it will appease it. It will never be done as money is seen by many as the path to happiness when it’s not, it just makes things easier. There are probably better and more complicated ways to stop the amount of power players have but wouldn’t it be nice to see players lifting the FA Cup with pride and not an embarresed sense of smugness? And wouldn’t it be nice to see players celebrating playing in the Europa League because they get a chance to play across Europe and not dissapointed because they won’t get the windfall of money from the Champions League?